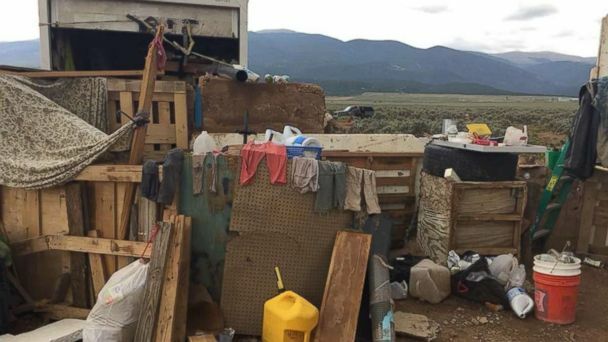 Investigators in New Mexico are working to identify remains that were found on the squalid campgrounds where police found 11 children living with five adults. "The remains are in a state of decomposition that has made identification challenging," Chief Medical Investigator Kurt Nolte said in a statement. "Investigators often try to compare remains to radiologic images, fingerprints, DNA or other identification materials. At this time, investigators are using all known methods to make an identification, but this will not be a quick process. If we must rely on DNA results, identification could take many weeks," he said in the statement. The search of the decrepit compound occurred in response to a search warrant for Siraj Ibn Wahhaj, who was believed to have kidnapped his then-3-year-old son in Georgia. When officers searched the compound, they found 11 children under the age of 15 and five adults, including Wahhaj, but not the young kidnapped boy. Taos County Sheriff Jerry Hogrefe said Tuesday that the remains belonged to a young boy. The remains were found on Monday on an "inner portion" of the compound, Hogrefe said. Wahhaj is under investigation in the death of the child. All five adults -- including Wahhaj, another adult male and three adult women -- have been arrested and charged with 11 counts of felony child abuse. Wahhaj was also charged with child abduction, while the other adult male, Lucas Morten, was charged with harboring a fugitive. Wahhaj did not enter a plea when he appeared in court Wednesday afternoon. A judge ruled that he be held until a no-bond hearing takes place within the next five days. The four other adults also appeared in court Wednesday. Morton and two of the women pleaded not guilty, while a third woman did not enter a plea.